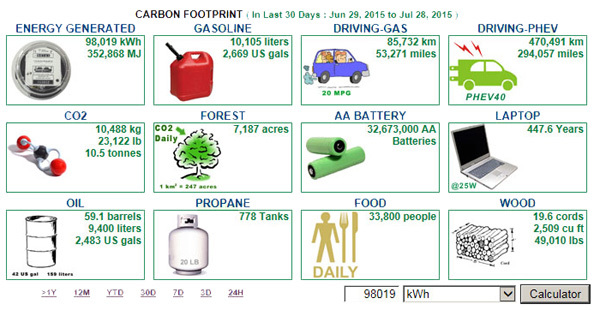 Select Carbon Footprint in the Analyzer to see the carbon reduction from energy generated for any time period including energy equivalents of common fossil fuel sources and energy consuming devices. This is a useful learning tool to obtain a better understanding of the contribution from solar energy to sustainability and GHG reduction. 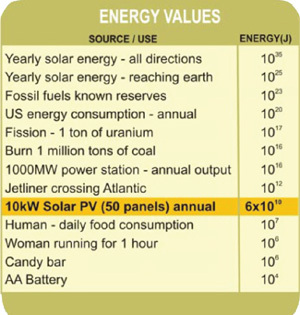 For lobby displays, the carbon footprint panel refreshes every few minutes with different energy equivalents like batteries saved or tons of CO2 to help visitors appreciate the value of solar PV systems. Schools can use lessons from the WebLab learning module to teach students about the practical savings that solar PV systems can provide. 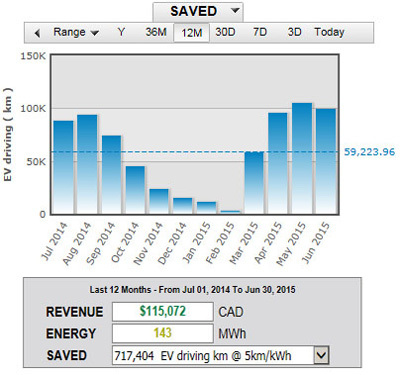 Convert the energy generated for any time period to the equivalent savings such as CO2 reduced or litres of gasoline not consumed in the LIVE screen using the Savings graph.